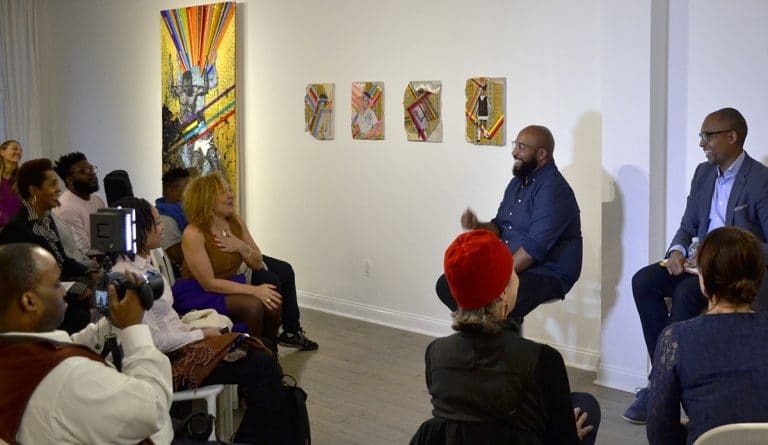 Long Gallery Harlem finishes off Black History Month by opening a gem of an art show. Fellow graduate of the School of Visual Arts MFA 2016, Delano Dunn brings us an intriguing exhibition titled No One Can Be This Tomorrow, curated by the incomparable Jasmine Wahi; this show is sure to raise eyebrows. The first thing I noticed about the work was the black-and-white photographs surrounded by bountiful color. In this body of work the artist employs the notion of the rainbow. Combining the rainbow with black and white photos of black Americans instantly brings about ideas of romanticism and hope. It is no secret that black people have struggled to gain equal standing in America since the beginning. Dunn’s work challenges our ideas about that relationship and what may come of it in the future. Life isn’t always gold and rainbows but in every dark situation light can still shine through. Though the photographs and bright colors are what initially stand out, upon closer investigation one finds how complicated the layers are in each piece. Every piece in the show is an intricate collage. It is clear that Dunn is critically selective of the materials he employs. Woodgrain, wallpaper, and shoe polish all seem to be indicative of a certain time in history. For me the shoe polish signifies the harsh reality of daily life. These black blobs cloud golden backgrounds and become an integral part of the figures environment. Life isn’t always gold and rainbows but in every dark situation light can still shine through. Whether it’s the falsehood of a black american utopia, or the notion that racism can not be allowed to exist… “No One Can Be This Tomorrow “. Take a look at the image of Delano Dunn pointing at 4 small works in his show. When I saw those four pieces I thought of the four little girls bombed in that Birmingham church by a racist in the sixties. It’s troubling to find similarities in more recent events like the church in Charleston, SC massacred by self proclaimed racist Dylan Roof in 2016. Dunn has the ability to pack in profound information into calculated visual ideas. It’s hard to say what you should leave feeling. Whether it’s the falsehood of a black American utopia, or the notion that racism can not be allowed to exist…No One Can Be This Tomorrow. Did you get a chance to see the show? Scroll through the images from our visit to Long Gallery Harlem. Tell us your thoughts about the show, the artist, and this reaction in the comments bellow! Delano Dunn brings us an intriguing exhibition titled "No One Can Be This Tomorrow". Utilizing rainbows, gold, and other mixed media Dunn creates an intriguing conversation about blackness in America.